No more goop, gagging, or discomfort. 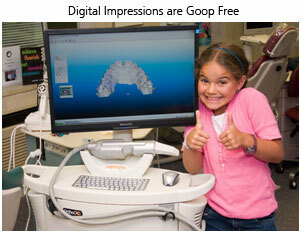 Using an iOC™ scanner, your dentist can take a highly accurate digital orthodontic impression. This new technology completely eliminates the tray and putty impressions where the experience is comparable to stuffing a big wad of gum in your patient's mouth. The old technique is incredibly unpleasant and uncomfortable. Often multiple rounds of impressions are needed which can be rejected, broken, or misplaced. An iOC scanner ensures a more accurate impression from the start, resulting in improved orthodontic treatment and a more comfortable patient experience. 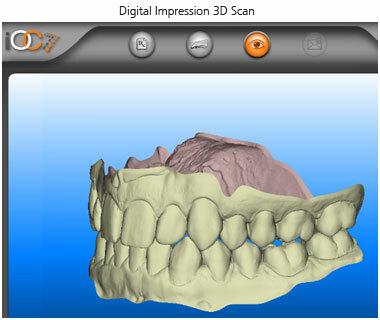 Digital impressions give the patient the ability to see their teeth instantly in 3D, improving communication during the consultation and treatment process. The iTero scanner digitally captures the structure of the teeth and gums using the latest optical technology. The scanner is a compact, hand-held wand. 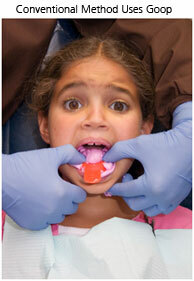 Once your dentist begins the scanning process, it can be stopped and started as many times as necessary. Your mouth is scanned with a radiation-free laser and in as little as two to three minutes renders a digitally perfect, 3D impression of your teeth and soft tissue structures. Through digital software you'll then be able to follow the progress of the scans including a three-dimensional model of your teeth on our computer screen. How Does it Work? The iOC scanner digitally captures the structure of the teeth and gums using the latest optical technology. It scans the mouth with a radiation-free laser and, in six to eight minutes, renders a digitally perfect, 3D impression of the teeth and soft tissue structures. Through digital software you'll then be able to follow the progress of the scans including a three-dimensional model of your teeth on our computer screen. The iOC scanner can be used for any orthodontic treatment including traditional metal braces and clear aligner-based orthodontic systems. Impressions taken with the iOC scanner are perfect every time and last a lifetime. "I loved the people. The orthodontists, receptionists, and nurses all were very personable. They made the long wait easier and enjoyable. I always thought braces would be a pain, but Brace Place made it an experience I’ll never forget." "For two years, the experience at Brace Place for me has been a positive one. The doctors and staff have been very attentive and caring to my needs. I am pleased with the work so far and would definitely recommend Brace Place to others." "As a patient, I had an excellent experience at Brace Place. You worked until my adult teeth were perfect. I was always impressed by the staff and doctors' professionalism. Now that my children are patients, I have complete confidence that their orthodontics will be done correctly. Your office is comfortable, the staff is great and I’d recommend you to anybody." Freehold Office 509 Stillwells Corner Rd. Manalapan Office 800 Tennent Rd. Hightstown Office 234 Princeton-Hightstown Rd.